Jane, a middle-aged mom, has steered well clear of the criminal justice system ever since she was charged for felony drug possession in 2003. Despite over fifteen years of crime-free behavior, she says retailers and pharmacies have repeatedly turned down her job applications due to the criminal record that inevitably comes up on background checks. So when Jane, who used a pseudonym to protect her identity, learned she was eligible to get her real name cleared under a New York law that went into effect in October 2017, she sought out the New York Legal Aid Society, where attorney Emma Goodman helped her file a petition to seal the case records. Jane is one of an estimated 100 million Americans — roughly 1 in 3 — who have some kind of criminal record, according to the Bureau of Justice Statistics. Offenses can range from violent criminal convictions to relatively minor crimes such as drug possession or failure to pay court fees. Even arrests without conviction can end up on rap sheets that last forever. Before the digital era, these records were only available to people who physically went and examined documents at police stations and courthouses. But in today’s interconnected world, most employers, landlords and universities use online background checks to sift through applicants’ personal histories. Now a previous run-in with police can be a barrier to getting a job, finding housing, qualifying for public benefits and even going to college, becoming what advocates call “a life sentence to poverty” for those with records and the nearly 50 percent of American children who depend on them. Last year, a growing awareness of how criminal records can have long-lasting consequences led a wave of 20 states to make it easier for people to clear their records via expungement or sealing. But the process of clearing one’s record can be hard to access. The New York law that allowed Jane to seal her record, for example, could apply to more than 600,000 eligible people. According to the state’s criminal justice statistics department, however, only 825 people have taken advantage of the law so far, a less than 1 percent participation rate. Goodman, who represents about 200 clients in addition to Jane, said that like many sealing laws, the Empire State record-sealing measure is too narrow: restrictive qualifications prevent applicants from having more than two offenses or any crimes in the past decade. She also said the process that was “supposed to be pro se friendly” is actually quite challenging, starting from the application form itself, which offers “just a couple of blank lines” for people to explain why they’re rehabilitated and deserve to have their record sealed. “There’s just not enough space to actually answer those questions,” she said. And it’s not just one filing. Petitioners in New York and other states with record-clearing laws have a long road to a clean record. The work — finding out if you qualify, locating the proper forms, correctly filling them out in their entirety, mailing them to the appropriate courts and law enforcement agencies, monitoring the response activity, appearing for any necessary hearings, managing any prosecutorial challenges, getting the record sealed and then ensuring all copies of the record are also sealed — can take years. Those who qualify for federal assistance can get free help navigating the bureaucracy from legal services attorneys like Goodman, but regular income earners often turn to law firms that can charge up to $2,500 per record-sealing case. 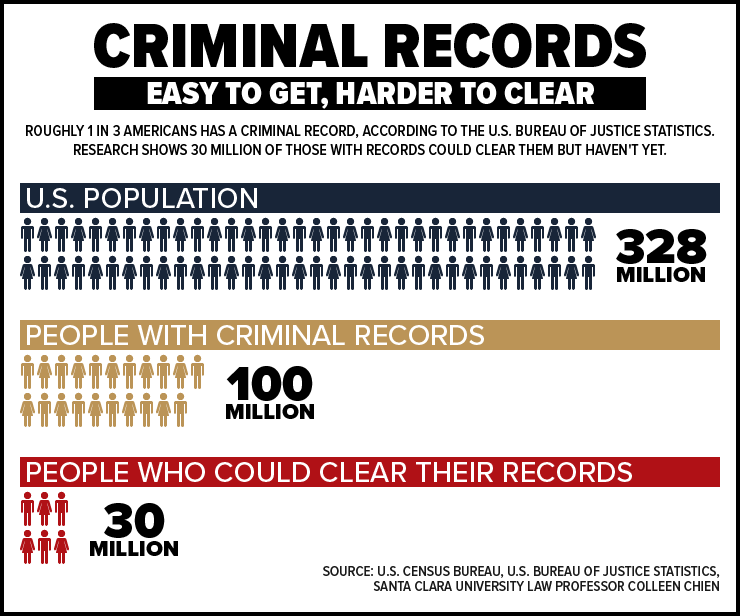 As a result of the system’s complexity, most Americans eligible to clear their records never do it. The so-called “second chance gap,” according to research by Santa Clara University School of Law professor Colleen Chieng, includes an estimated 30 million people. To help close that gap, some states are moving to make the process automatic by putting the burden on the government instead of the person with the record. In December 2018, Pennsylvania’s first-of-its kind “Clean Slate Act” went into effect, promising to automate the system of sealing low-level misdemeanors once a candidate goes 10 years without a conviction. Non-conviction arrests may be automatically sealed with no waiting period, paperwork or fees. Federal legislation by Delaware Democratic Representative Blunt Rochester aims to turn Pennsylvania’s model into a national law. The bill filed in August would automatically seal misdemeanor drug crimes and nonviolent offenses involving marijuana, as well as create a petition system for other nonviolent offenses that are currently unsealable without presidential intervention. The Center for American Progress played a key role in drafting both bills, and its director of poverty, Rebecca Vallas, said the clean slate movement comes from both sides of the aisle. She highlighted the involvement of FreedomWorks, a conservative and libertarian advocacy group, in drafting and lobbying for the federal Clean Slate Act. “This is an area of incredibly rare bipartisan agreement at a time when it seems like Americans can’t agree on almost anything else,” Vallas said. But some advocates say the Clean Slate Act, while a good step, still doesn’t go far enough. Sarah Lageson, a sociologist at Rutgers University who studies the criminal justice system, said that record-sealing laws don’t erase the collateral online damage of a rap sheet. Lageson pointed to the for-profit mugshot and reputation management industry, which uses sunshine laws to obtain and publish public records on the internet, then charges people to take them down. Unless we also legislate privacy protections or different classifications of these records at the same time, sealing can be a pretty ineffective remedy for people. “Unless we also legislate privacy protections or different classifications of these records at the same time, sealing can be a pretty ineffective remedy for people,” she told Law360. Lageson has called for bolder reforms like offering free access to one’s own criminal records, instead of requiring people to pay as much as $40, and making mugshots private. She also believes states should enforce fines on third-party websites if they fail to comply with expungement or sealing orders by keeping the outdated information accessible. “You might get someone who operates a website who will update your record, but they don't have to,” she said. Some newspapers and websites, like Mississippi’s Sun Herald, have moved to discontinue their mugshot galleries. Cleveland.com unveiled a “right to be forgotten” initiative in January, giving people a chance to scrub their names from old stories. “The release of criminal booking photographs to the public will result in greater transparency in the criminal process, enhance public safety, and will further assist the media and the public in the proper identification of individuals in the criminal process,” South Dakota Attorney General Marty Jackley said at the time. The South Dakota law means every state except Louisiana has publicly available mugshots that can live on online, despite anyone’s efforts to clear their name. Jeran Crawford, an employment specialist at the New Jersey Re-entry Corporation, knows firsthand about the pervasiveness of an old booking photo. Sentenced in 2010 to two years of probation for drug possession with intent to distribute, Crawford said his criminal record initially kept him from qualifying for student loans or getting a job at anywhere other than a gas station. He’s since married and had three children, so the record affects them too: Crawford said some landlords have refused his whole family as tenants. Now eligible for relief under a New Jersey law, he’s already been fingerprinted and filed a petition with the help of volunteer lawyers. He said he’s looking forward to officially clearing his name, but added that a simple Google search brings up his old mugshot.